As I drove through the Flint Hills this week in late June, there were orange dots among the prairie grasses that caught my eye. 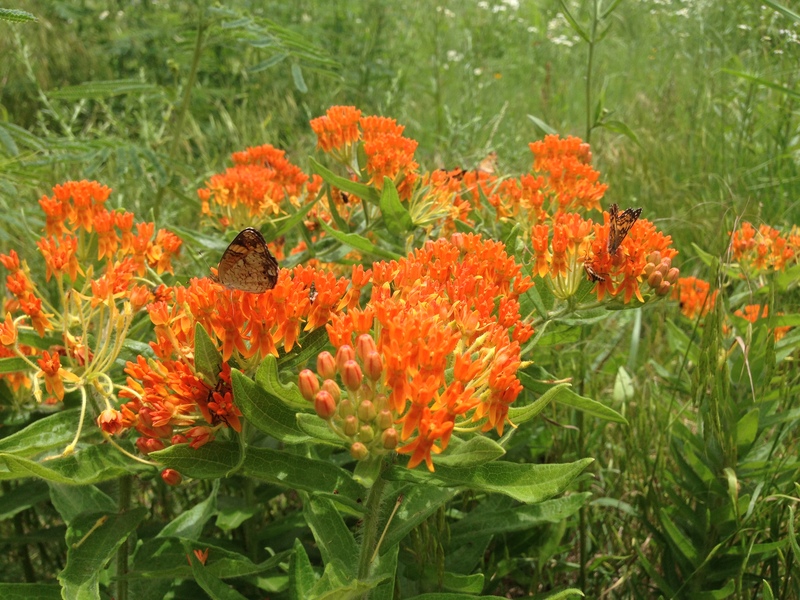 Few plants found on the prairies of Kansas are as readily recognizable as butterfly milkweed (Asclepias tuberosa). 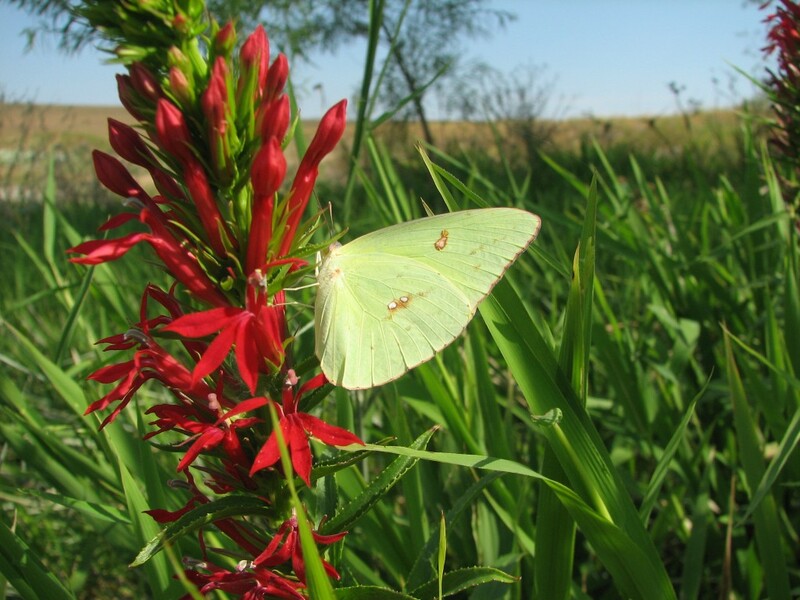 This classic prairie plant found throughout the eastern two-thirds of Kansas blooms from late May into August. Butterfly milkweed is a stout one to two foot tall perennial with a deep, coarse, fibrous root system. 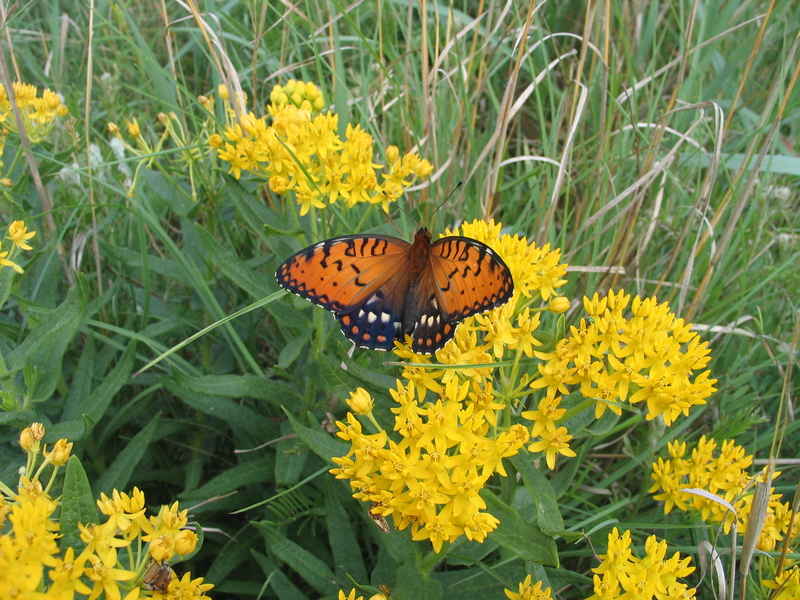 Flowers range from deep orange-red in the eastern part of its range to lighter orange and finally yellow farther west and south in Kansas. 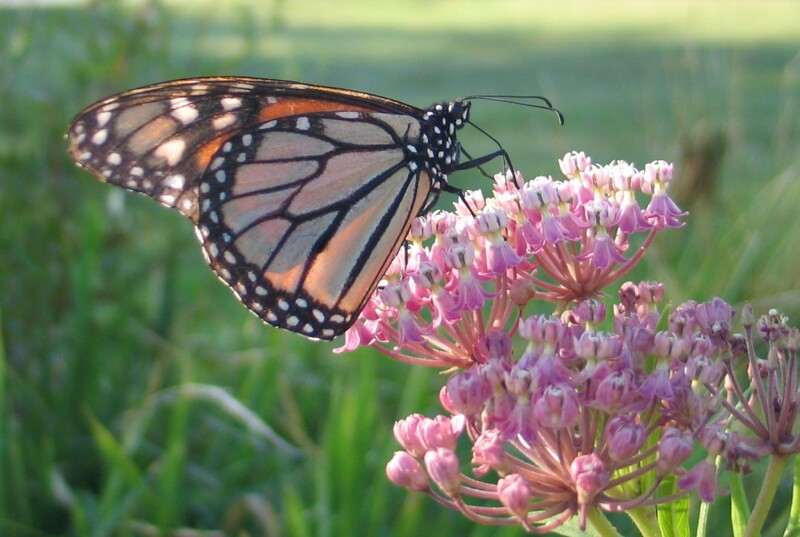 Unlike the numerous other milkweeds found in Kansas, butterfly milkweed does not exude a white milky sap when the stem is cut or a leaf is removed. 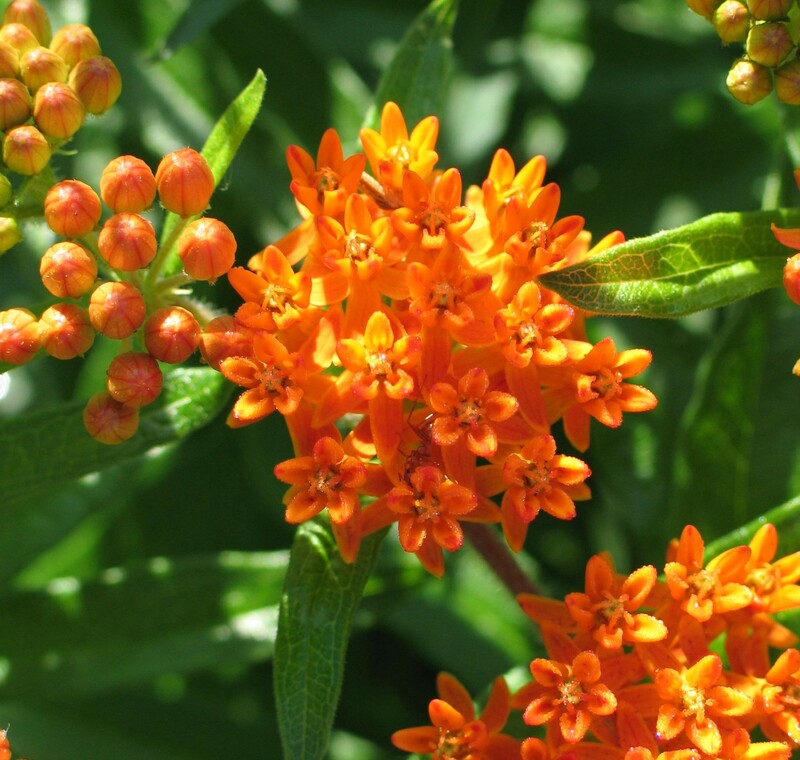 Generally available in garden centers and nurseries as well as our FloraKansas Plant Sale, butterfly milkweed can easily be used in a perennial border or in wilder, more naturalistic plantings. Somewhat slow to establish because of the coarse roots, butterfly milkweed is a long lived plant and an excellent competitor in the garden when challenged by more vigorous plants. While it prefers full sun and good drainage, it will tolerate light shade. 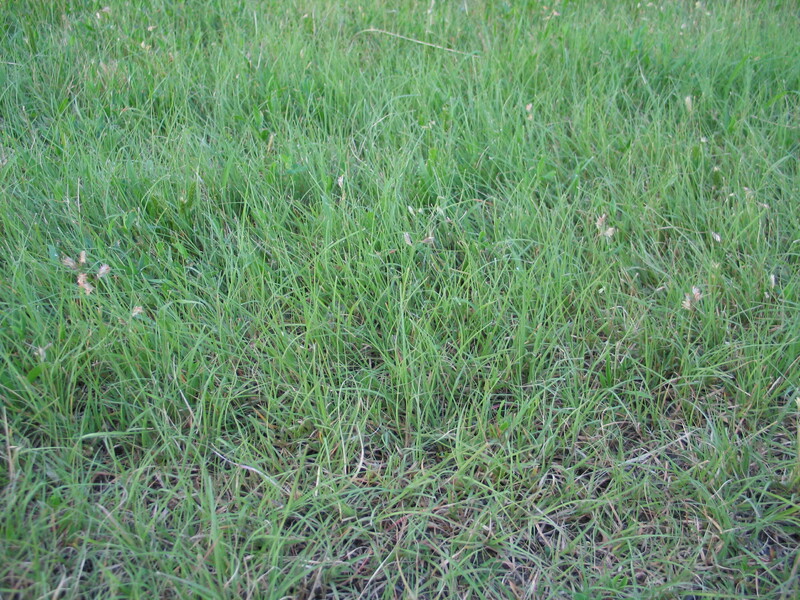 It is also very drought tolerant once established. Several cultivated varieties of butterfly milkweed have been developed. These include ‘Gay Butterflies’, a mix of red, orange, and yellow flowered plants, and ‘Hello Yellow’, an exclusively yellow flowered selection. The common name is derived from the blossom’s ability to attract butterflies and a host of pollinating insects. The complex flowers actually have pollen sacs attached to a y-shaped structure or stirrup. These structures attach to visiting insects and are consequently carried off to the other flowers in the vicinity, allowing cross pollination to occur. Fruits are long, skinny pods, typically three to six inches long. These contain many seeds, each having a tuft of white, silky hairs. As the pod dries and splits in the fall, the seeds are carried away by the breeze, each equipped with a tiny parachute-like structure. 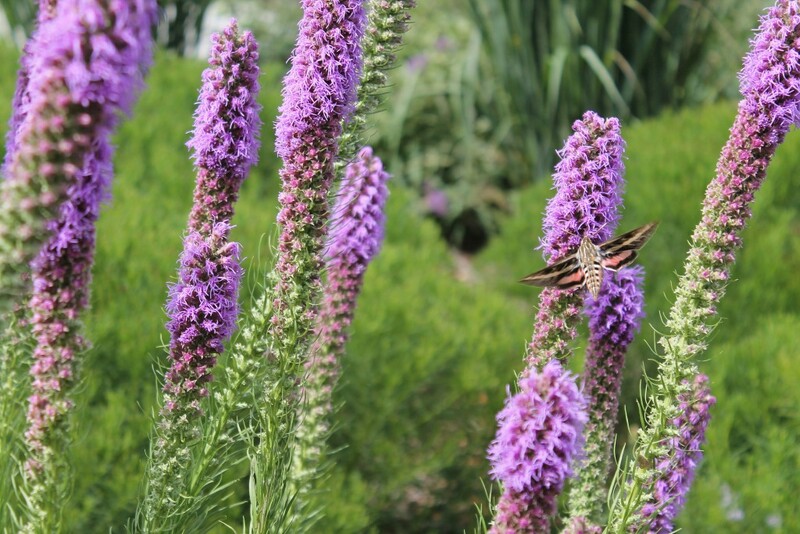 Did you know that this week is National Pollinator Week (June 15 – June 21)? Whether it is with bees, butterflies, birds or beetles, pollinators are extremely important and provide valuable services. Three-fourths of the world’s flowering plants depend on pollinators to reproduce. Think of all the food crop production that would not be possible without the help of pollinators. We rely on these small, seemingly insignificant pollinators for the food we eat. If they are so valuable, then they are certainly worth recognizing and saving. I recommend planting wildflowers that bloom at different times of the year. A mixture of wildflowers coming into bloom and going out of bloom throughout the year provides a ready food source. This approach mimics the natural prairie and the changing seasons. Layer trees and shrubs along with wildflowers and grasses. These plants provide shelter from the wind along with nesting sites and food for birds, butterflies and bees. Even a small garden can have a tremendous impact. 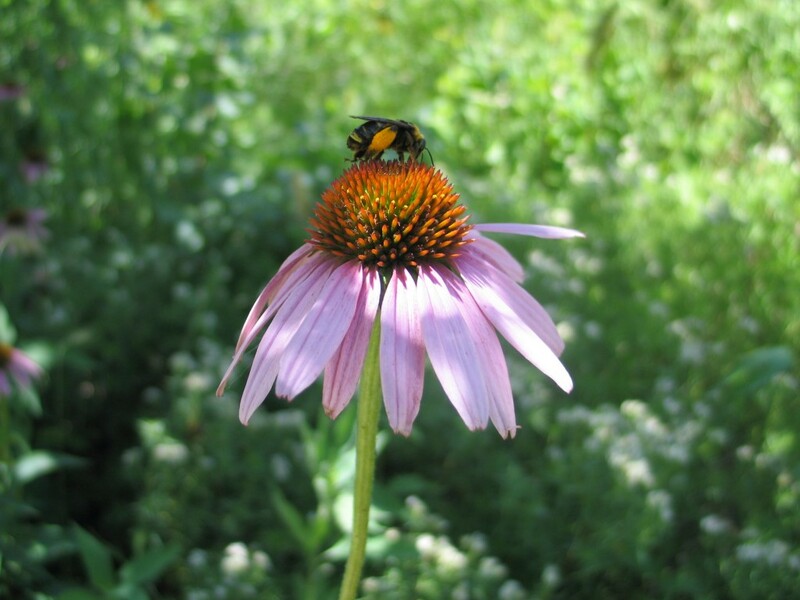 When it comes to supporting the life cycle of pollinators, you can be part of the solution. Native wildflowers are the best option to help them prosper. You will be amazed when you introduce just a handful of wildflowers to your landscape. If you plant them, pollinators will come. Consider the power of one vs. the power of many. The power of one may at first seem insignificant. However, with persistence, consensus-building, and sometimes even a little luck, that power can grow to many and build to a formidable presence. 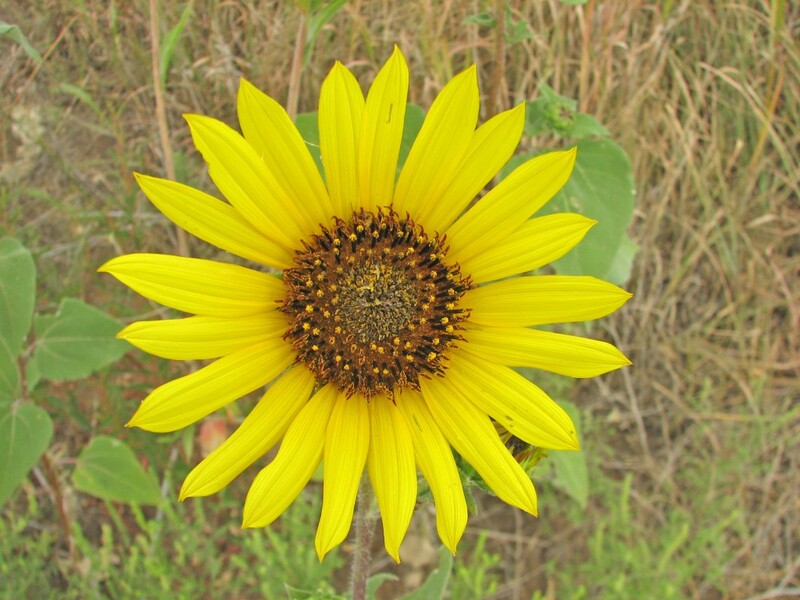 From one seed, a typical annual sunflower head produces hundreds and sometimes over 1,000 seeds depending on the species variety. 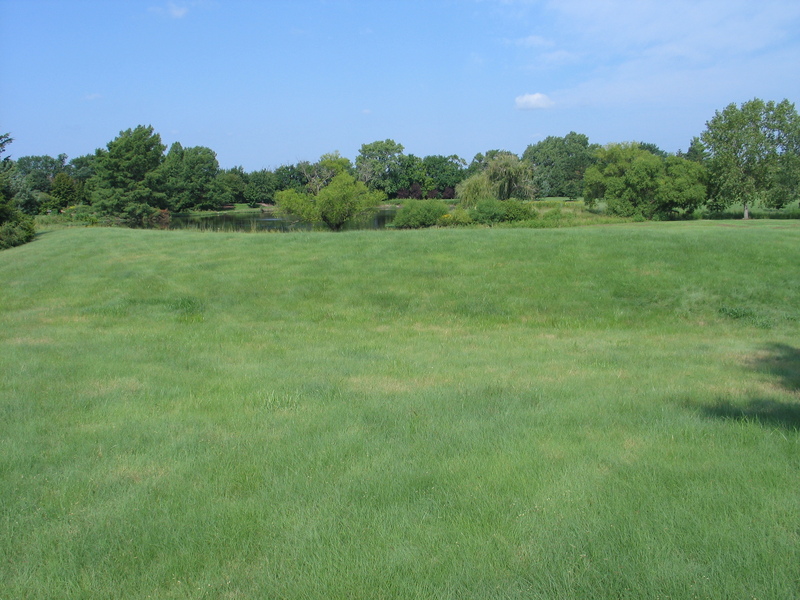 A few plants in an area with open soil can quickly turn into an area dominated by this species over the next couple of years. One Canada goose only has so much energy to give while covering miles during migration to fight wind currents and arrive at its intended destination. 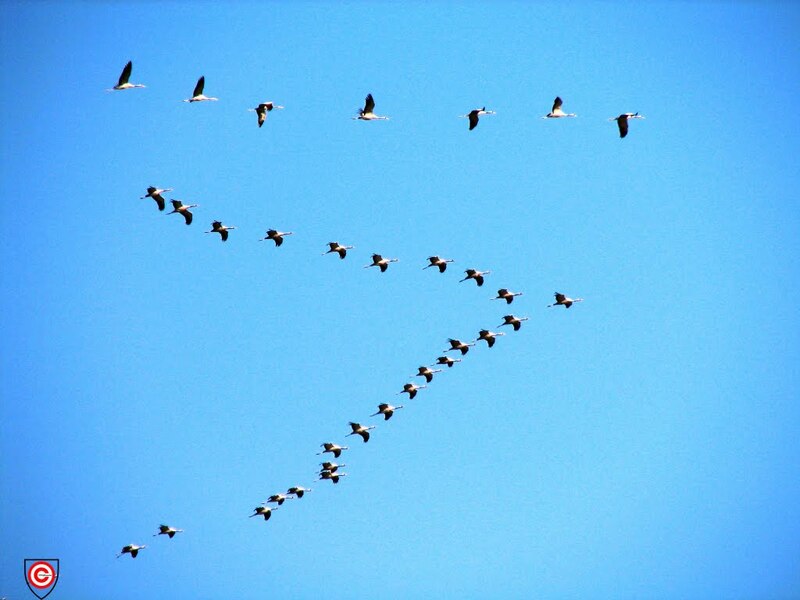 But by flocking into a V formation in flight, each individual rotates through the more energy-intensive front position in a cyclical fashion, shares overall flight fatigue, and greatly boosts the efficiency and range of the whole. 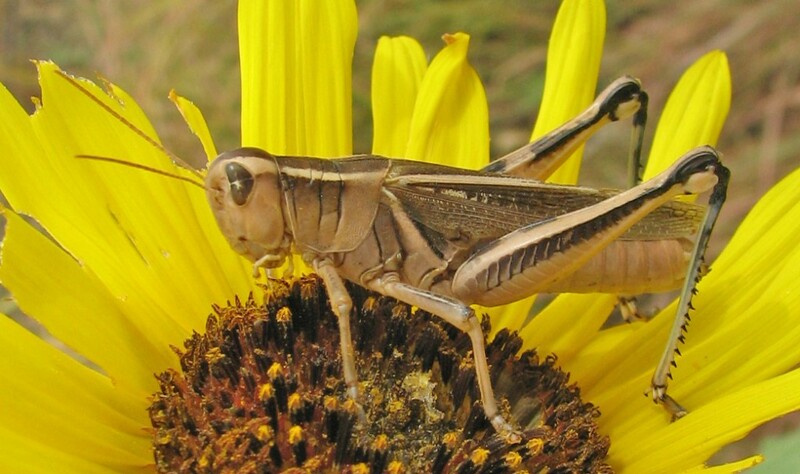 One by one, individual plants of hundreds of species of wildflowers and grasses took advantage of a favorable climate on the Great Plains after the last ice age 10,000 years ago. They extended their roots to a depth of 10 feet or more, produced flowers and distributed seeds, and filled new spaces as long-lived perennials. Prairie plant roots partially died and regenerated year after year after year, and in the process pumped loads of atmospheric carbon into a deep soil horizon, and created a long-lasting friable matrix that today helps produce food for the rest of the world. While pondering these examples on a walk this morning, I tried to swat individual mosquitoes, only to be overwhelmed by the presence of a blood-thirsty mosquito CLOUD. 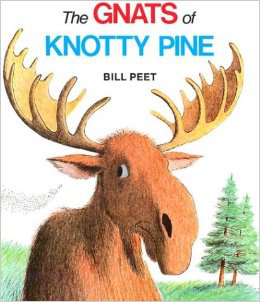 I was reminded of the “success of many” concept in the book Gnats of Knotty Pine from my favorite children’s author, Bill Peet. As during previous EPS summer institutes, spending a week with these people was a blast – exhausting, yet energizing, and ever so powerful for all involved on so many levels. 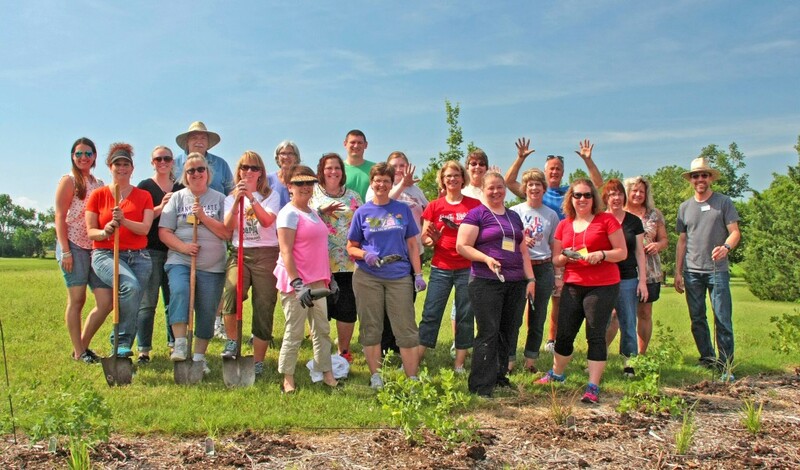 They will return to school in the fall with detailed action plans, an expanded toolbox of curriculum activities, and a new appreciation for the success of project-based, hands-on environmental education. I’m sure you will agree that every individual teacher has the power on his or her own to impact the lives of so many young people. 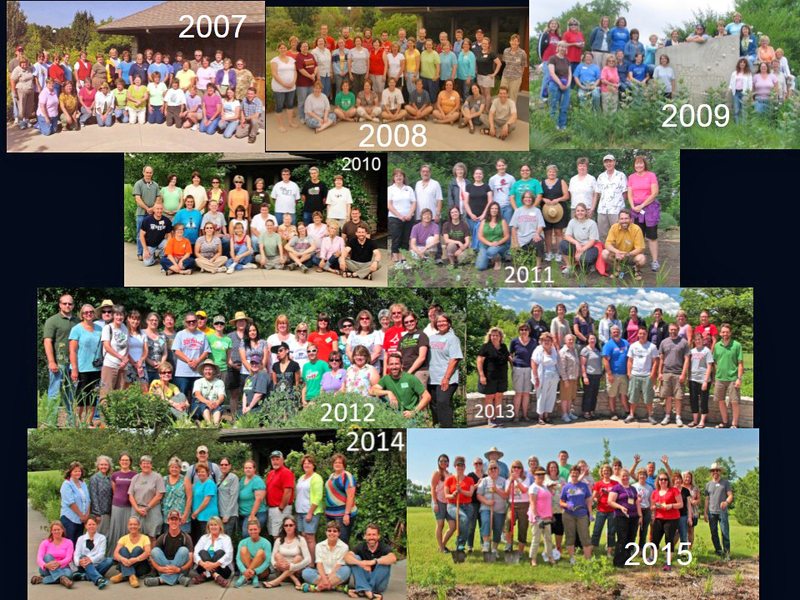 Together, this 2015 cohort has increased the number of EPS educators in Kansas to 194 teachers from 64 schools. These individuals, as a collective group, have reached over 21,000 students in the last eight years and that number will continue to grow.